First stop at Batubulan village to see the Barong and Kris Dance, a dance depicting an eternal fight between good and evil spirit. 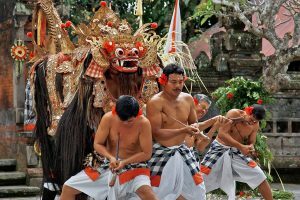 Barong is a large lion type creature played by two men representing of good spirit mean while Rangda which is with long fingernails and droopy breasts symbolizing the evil spirit. 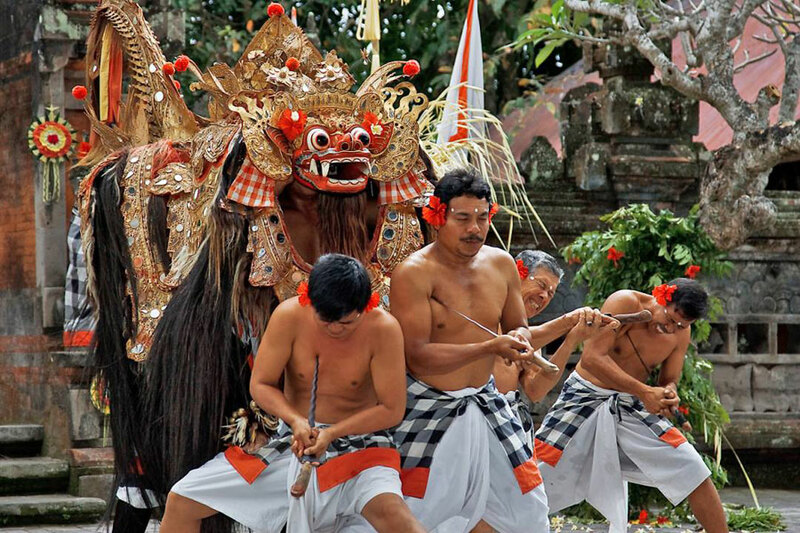 At the end of this story, a battle between good spirit, as a symbol of Barong and Rangda as a symbol of evil spirit. Nobody wins in this fight, finally dancer trance and stab himself with the hash but not until the wound. This village is located strategically on the main road form the Denpasar to Gianyar Regency which is about 5 km from Denpasar Town. 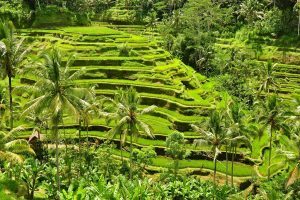 CELUK Village is the famous village in Bali as a tourist destination cause of the local residents is very proactive and full of innovation to the gold and silver crafting and owns the individuality and excellence in production of gold and silver crafting. Most of them are Balinese professional, artistic and skillful of design development related to the silver and gold crafting. They create many elegant designs, which are greatly influenced by local tradition. In According with the Balinese bilief, They treat every object as a human being, including the planning and lay – out of their house compound. The compound is basically divided into three parts on which part they build structure of different purposes. Applying the directional concept of their traditional compass, holy structures are built at the mountain at the mountain – wards of the compund such as shrinnes ( head ), in the middle yard are built all structures of living quarter ( body ), and at the seawards are kitchen,pigsty and remaining land where they usually throw rubbish away. we can see artist painter who paint on canvas. The Kemenuh village is located in Sukawati District, Gianyar regency. 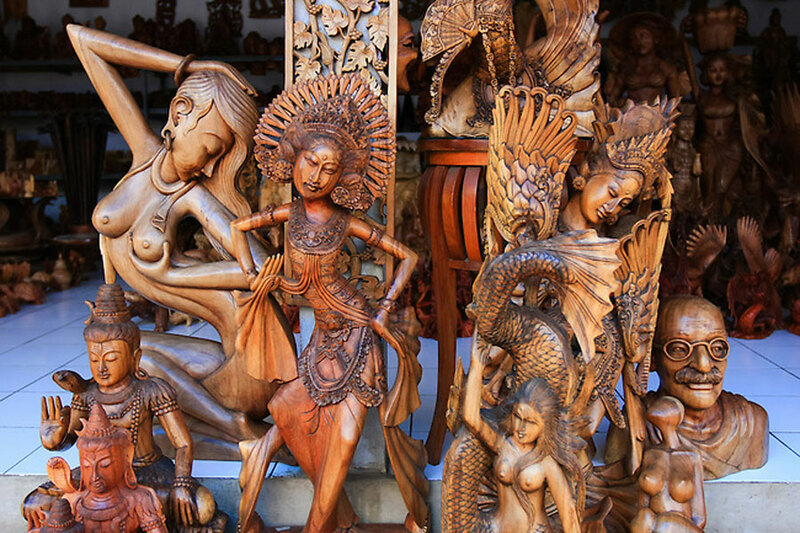 Just 10 minutes from Ubud.This Village, produce very good quality of woodcarving, made from very hard wood such as teak, mahogany, ebony and hibiscus wood, those of wood import from another island Java, Sumatra and Sulawesi. Kintamani – a mountain resort with its breathtaking view, magnificent view of the still active volcano Mount and wide Lake Batur in a valley.It is situated in the plateau area with cool weather surround it. When we stand up here we will be able to see the rural area which is close to the lake. 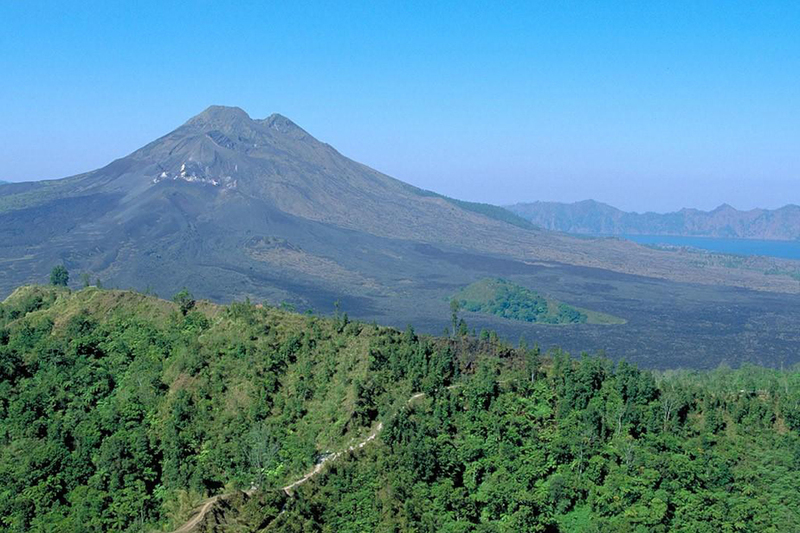 This place is very famous and visited by many tourists everyday Mount Batur has erupted three times in 1917, 1926 and the biggest one on 1963. 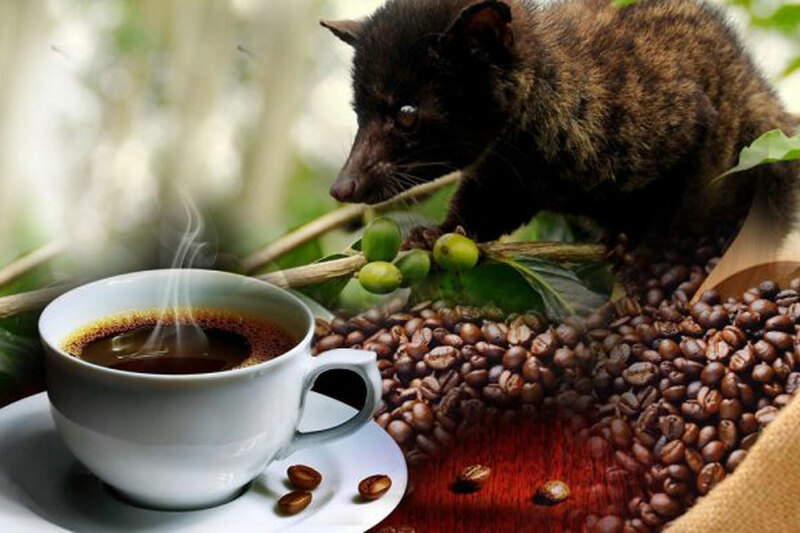 Walking amongs fields of local fruits, Coffee, Cocoa, Vanilla, Clove plantation .Bali coffee found mostly in the mountain central part of Bali, there are 2 kinds of Bali coffee the farmers grow in Bali is Arabica Coffee and Robusta Coffee. Others Tropical plantations ; pineapple, Balinese snake fruite (salak), plain Balinese potatoes, fruit stars, jack fruit, durian tree and many more,experience to see how to make Balinese coffee in very traditional ways, and taste the fresh of Balinese coffee or ginger tea with green view river valley and also They sell variety of theirs original Balinese coffee products, herb oil and etc and see the civet cat the most expensive coffee maker, wellknown as Luwak, its produce “Coffee Luwak”. Tirta Empul Temple or Tampak Siring Temple is located in Tampak Siring Village, Gianyar regency and it is about 39 km eastwards from Denpasar town, and one of the leading tourist objects in Gianyar, Bali. Tirta Empul Temple is a famous temple of holy water (spring water) The words of Tirta Empul consist of two words. 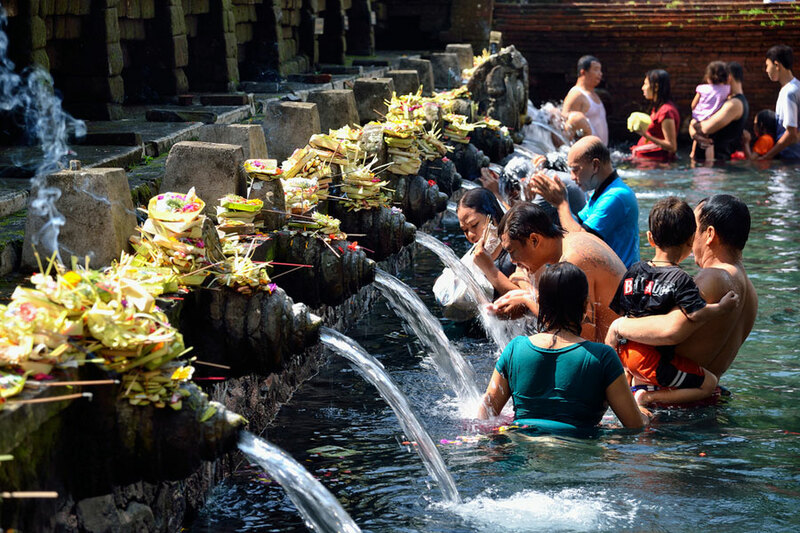 So, Tirta means holy water, and Empul meaning emerged from the soil. 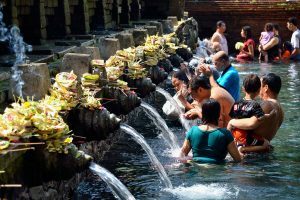 Hindu community believes that Tirta or purified water can purified and clean all the dirt both outer and inner dirt, or by the people of Bali called pengleburan in scale and timeless. Tirta Empul is also one of the main tirta used in every religious existence of Hindu ceremonies in Bali. West side of the temple is at an elevation of the Presidential Palace which was built on the rule of President Sukarno. Entrance ticket is IDR 25,000/ person. Located 7 km north of Ubud. Tegalalang Rice Terrace is one of the more popular rice terrace to visit. The rice terrace is designed very beautiful with exquisite hollowing rice field and precisely located on the hill bank. In this place, you will see the Balinese farmer do their rice field in oblique area complete with its system irrigation. You will enjoy the beautiful panorama of valley with rice terrace and coconut trees ornament it. 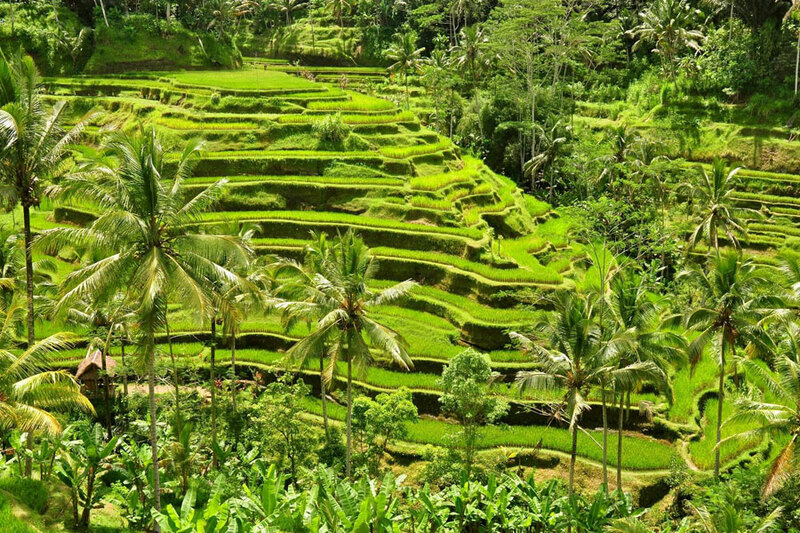 Tegalalang Rice Terrace is one of the tourist icon in Ubud Bali and many visited by tourists every day.